An icon among sea-lovers now returns in a reworked design: the Admiral’s Cup ACOne 45 Tides watch. 21 years after its launch, this model with its mechanical movement driving indications of the time and strength of the tides, the lunar cycle, aswell as the strength of the currents and the height of the tides, remains a truly unique complication in the Fine Watchmaking world. 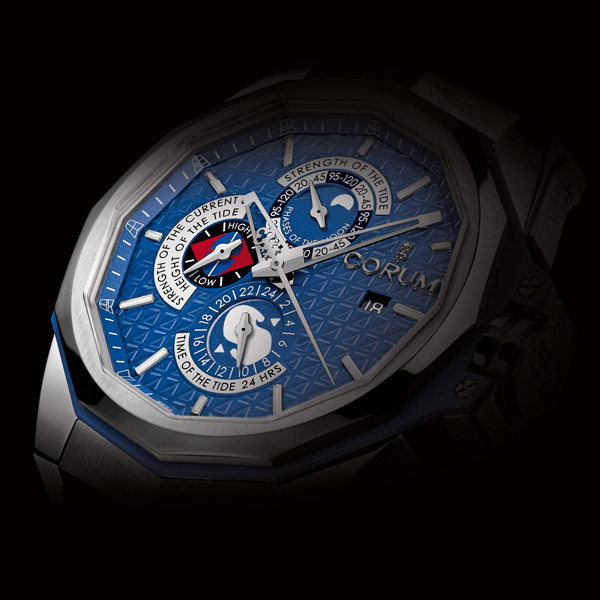 Its exclusive nature forcefully reaffirms Corum’s longstanding, solid nautical anchorage. The CO 277 caliber now provides its essential navigation-related indications on an ocean blue dial bearing subdials that are more graphically styled than ever. The Moon, which determines tidal movements, appears at 12 o’clock. When it is full or black (new moon), meaning when it is aligned the Earth and the Sun, the amplitude or strength of the tides – indicated by a dedicated hand on the dial – is at its peak, with a coefficient of between 95 and 120, dipping to between 20 and 45 during the first and last moon quarters. An authentic SHOM-certified precision navigating instrument, the CO 277 caliber beats at the rate of 28,800 vibrations per hour and has a 42-hour power reserve. Also driving a date display at 3 o’clock, it is housed in the emblematic 12-sided Admiral’s Cup case entirely worthy of its performances. 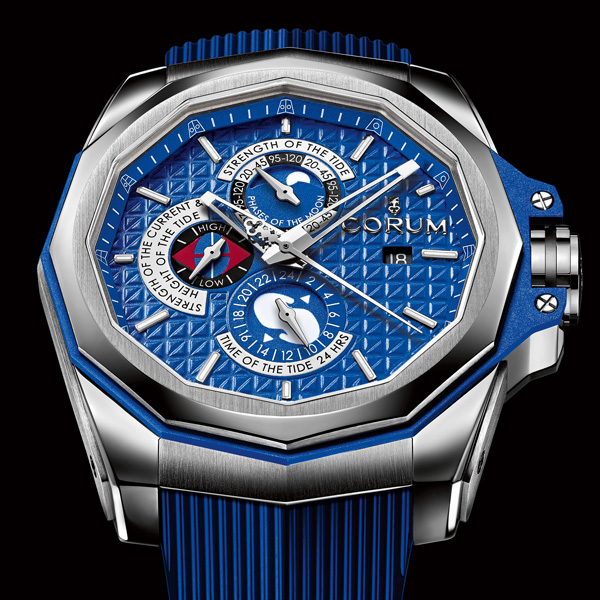 The latter is made in grade 5 titanium and remarkably light despite its powerful style and generous 45 mm diameter. 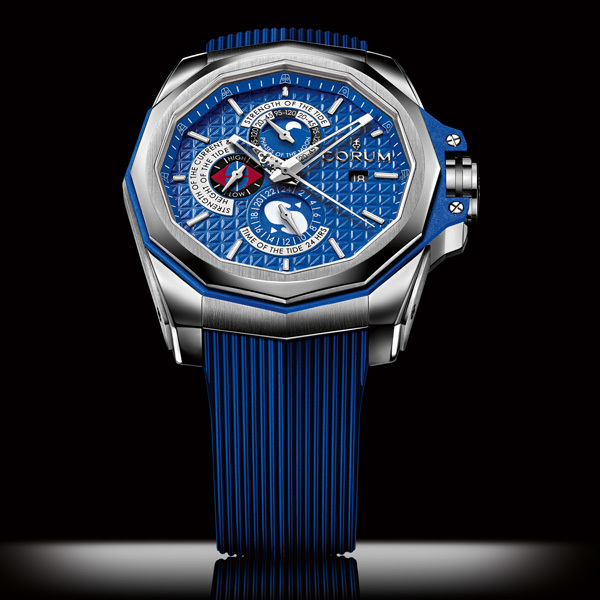 Its layered structure features blue PVD-treated titanium inserts echoing the color of the dial and the vulcanized rubber strap secured by a folding clasp. Clearly built for adventure, it is water-resistant to 300 meters and fitted with a sapphire back providing an admirable view of the CO 277 movement.